Home » Cooking » Chinese New Year 2017: Welcoming the Lunar New Year with Gaming and Dumplings! Chinese New Year 2017: Welcoming the Lunar New Year with Gaming and Dumplings! Written by: KristaG on January 27, 2017. 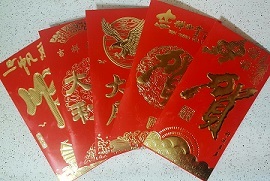 Every year I hand out lucky red envelopes on Chinese New Year; each with various items inside! Chinese New Year, or Spring Festival, is soon to be upon us yet again! This weekend will initiate the transition from the Year of the Monkey to another Year of the Rooster. Festivities traditionally last an entire fifteen days; starting on the new moon between January 21st and February 20th and concluding on the first full moon of the lunisolar year. The Lantern Festival (not to be confused with the Mid-Autumn or Harvest Festival) is held on the final day of the celebration and marks the end of the Chinese New Year festivities. In addition to giving out my red good luck envelopes to my friends, family, and game group and attending the local festivals this year, I am excited to be trying out a few new recipes and sharing a new game with my friends this weekend! Fresh out of the wok sweet and sour chicken dumplings! 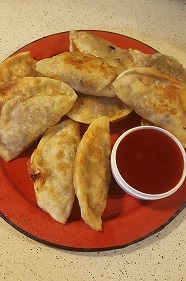 For our celebratory foods, I’ve chosen a few recipes out of a set of cookbooks that I got through a Kickstarter campaign last year written by Amanda Roberts, creator of the blog Two Americans in China. You can check out my review of her cookbooks (as well as read about my plans for food for our get together) at our sister site, I Am Your Target Market. Combined with my Player 2’s recipes and some desserts, it should lead to an amazingly tasty event! The best part? Most of these fillings can be made the day before if you’re going to be super busy like I will be! Included among the numerous games I suggested playing last year is one of my constant go-to games: Lanterns: The Harvest Festival. Though I stated above that the Lantern Festival that falls during Chinese New Year shouldn’t be confused with the Harvest Festival, Lanterns is still a great game to play in both the spring and the fall. This year I am excited to announce the first “big” expansion for Lanterns! 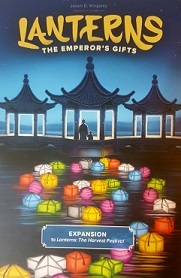 Though I am unsure if Renegade Game Studios planned for the release of Lanterns: The Emperor’s Gifts to be just in time for Chinese New Year, I’d like to imagine it was and the timing is perfect for me to get a chance to introduce it to my fellow gamers! As with the base game, Lanterns: The Emperor’s Gifts is playable for 2-4 players. However, instead of just adding more lantern filled tiles as has been done with promos in the past, several new mechanics, new components, and a whole new level of depth have been added to the game! Though there has been some scrutiny from fans about the expansion being designed by someone other than Christopher Chung, I’m sincerely hoping to put those comments to rest when I say that though players have more game changing options while they play, Jason Kingsley’s expansion keeps with the simple elegance of both design and game play that I have praised time and again in regards to the base game. For the most part, set up and game play haven’t changed all of that much with the introduction of this expansion. The game and number of components used still scales based on the number of players. 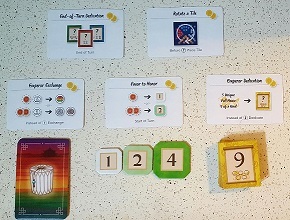 The expansion does make a slight change when playing a 3-player game so players now only use 6 Lantern Cards instead of 7 when making their “supply.” Otherwise, there are only a few key changes to set up due to the new components. These are rather simple to implement and understand, though. The expansion includes a new starting Lake Tile which is devoid of the boat, has a slightly different starting design, and has a grey backing to make it easily discernible from all of the other tiles in the game. Other than a new look, the starting Lake Tile itself still functions exactly the same way (it is flipped, Lantern Cards are handed out, and the first player is chosen based on whomever received the red Lantern Card). The 5 Emperor Cards and any required extra components. Things that are new, however, and do cause some set up changes are the Emperor Cards and pavilions. During the beginning of set up, 2 Emperor Cards are chosen at random from the 5 included Emperor Cards and are placed face up, in view of all other players. The unused cards are returned to the box. I would like to add that some of these cards – namely the Favor to Honor, Emperor Exchange, and Emperor Dedication cards – require additional set up. All extra components for these cards are included and their effects and set up requirements are explained in detail in the included rulebook. When playing with the cards that have extra components, my group and I tend to put them with the similar base game components. For example, Wild Lanterns go in the supply area with the rest of the Lantern Cards and the Emperor Dedications go in the same area as the standard Dedications. Player pavilions, the Emperor’s Pavilion (gold), and the Gift Tokens. Pavilions were incorporated into the game to follow the “Emperor’s decree” for this year’s festival. The Emperor has proclaimed that pavilions will be constructed on the lake in addition to the lanterns so, in order for this to be possible, the expansion provides wooden pavilion pieces in 5 colors: red, white, purple, blue and yellow. 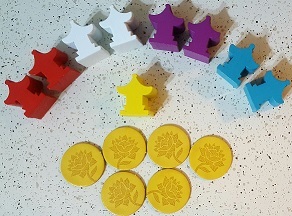 The Emperor’s Pavilion (yellow) is placed on the starting Lake Tile and players then receive a number of pavilions in their player color (3 pavilions in a 2 player game, 2 pavilions for games with 3+ players). Any extra pavilions are set aside and remain unused for the rest of the game. Pavilions work similarly like the Lake Tiles with platforms on them (specific tokens are received for making color matches next to these tiles), but instead of receiving Favor Tokens for color matches, players will receive a new form of currency: Gift Tokens. As I stated earlier, game play also does not change very much with the introduction of this expansion. 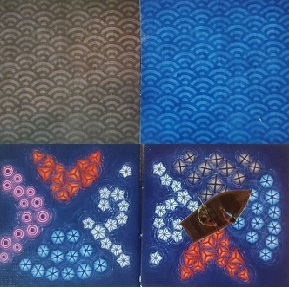 Each player turn still consists of 3 steps: Exchange a Lantern Card, Make a Dedication, and Place a Lake Tile. However, some of the options available to the players during these steps have changed depending on which Emperor Cards are in play and if a player wants to place a pavilion during their turn. For the most part, unless stated on a specific Emperor Card, the Exchange and Lantern Card and Make a Dedication steps are the same. It is important to note that not all Emperor Cards are used during the same step of a player’s turn and, as only one Emperor Card may only be activated once per player turn, the player must choose which card they are going to activate out of the two. When laying a tile, though, there have been some significant changes. Once a player has placed their Lake Tile, they may choose to build a pavilion on that tile. Building pavilions does come with restrictions, though. Pavilions can not be built next to connecting tiles that already have pavilions on them (meaning: a pavilion may be placed on a Lake Tile diagonal to another one with a pavilion, but not on an adjacent tile), they can not be built on tiles with platforms on them, and a player can not build a pavilion on a previously placed tile. In addition to the active player receiving a Gift Token for the color match, the owner of the pavilion on the linked tile will also receive a Gift Token in addition to their Lantern Card that they would normally receive. The end of the game is also still the same: once the last Lake Tile is drawn and placed, the game ends. All honor is added up (in this case, the honor earned from making dedications plus any Honor Tokens purchased with gift tokens) and the player who has earned the most honor is declared the winner. The expansion adds an additional tie breaker option, but otherwise, all other ties are broken down according to the base game rules. With all of this being said, I would be remiss if I didn’t explain what Gift Tokens actually do in the game! Gift Tokens are used in relation to the Emperor Cards much like Favor Tokens can be spent during the base game. They are spent in quantities of 2 in order to perform actions according to those detailed on the Emperor Cards in play. For example, if the Rotate a Tile Emperor Card is in play, a player may choose to spend 2 Gift Tokens to rotate any tile already in play as long as it follows the rules for rotation as explained in the rulebook. Some of these “gifts” from the Emperor are some big time game changers when it comes to creating winning strategies so learning what they all do, learning how to mix and match the various cards in play, and learning when to employ which Emperor Card is a wonderful new layer and a crucial step when playing with this expansion. I love how balanced playing with the two Emperor Cards is and how there are different strategies to using the myriad of combinations that can arise. Some combinations play off of each other really well (such as having the option to rotate a tile one turn and then hand in an extra dedication at the end of your next turn) and others, at times, don’t have a lot of synergy and make players work harder to earn extra Honor points. For a gamer like me who happens to get stomped on more often than not in two player games, I’m thankful for having a few more strategies to fiddle with and explore and, yet, the game still scales well to fit more players and this expansion gives me a little more wiggle room to compete with. I will admit, I was a little worried at first about these additions bogging down the game, but they don’t. Instead, they only add to the beauty or it and provide a great way to change it up every now and again while still allowing me to play quiet games at home between myself and another or take it with me to things like game day this weekend where we will be entertaining several others. While not a necessary purchase for your game shelf, I find Lanterns: The Emperor’s Gifts a great way to bring optional, further depth to the base game for those players that are looking for it and it was worth every penny I spent on it. I wish you all great luck and prosperity with the coming Year of the Rooster!